Mobile analytics firm Validas has created a Pinterest contest to celebrate the mission of redirecting “Wireless Waste” by “pinning for a purpose”. 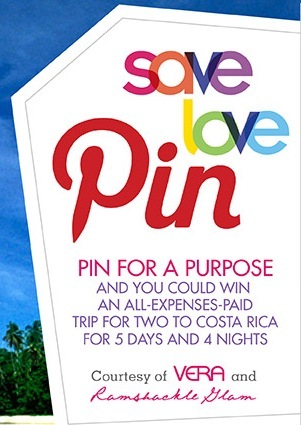 The contest encourages Pinterest users to pin images that best represent what saving, loving and giving means to them. One grand prizewinner will receive a trip for two to Costa Rica. Five finalists will be announced on February 12 and then final voting will be open on the company’s Facebook page until February 28, 2013. This Pinterest contest is not a cause marketing campaign in and of itself but a free app called VERA from Validas supports a cause-based business model. The app analyzes a consumer’s monthly wireless bill, recommends alternate plans that save money and then enables the user to donate savings (or not) to Seven Bar, a micro loan foundation. This Pinterest campaign caught our attention as a potentially effective way to harness user content to visually promote the company’s own cause-based message. Adding a large incentive like a trip to Costa Rica (and smartly pointing out that Seven Bar funds micro loans in Costa Rica) certainly won’t hurt participation. What do you think about this Pinterest campaign? Weigh in below!